At 11h00, Saturday, 16th March, NSRI Simon’s Town and CMR (Cape Medical Response) paramedics were alerted by a dive charter boat reporting to be headed towards Simon’s Town with CPR (Cardio Pulmonary Resuscitation) efforts being conducted on a 63 year old British man who surfaced from a scuba dive and collapsed unconscious – suspected to have suffered a heart attack. MRCC (Maritime Rescue Coordination Centre) had been alerted following VHF Marine radio communications made to Telkom Maritime Radio Services. NSRI and CMR paramedics met the dive charter boat on her arrival at Simon’s Town harbor where advanced life support CPR continued. Sadly after all CPR efforts were exhausted, the man has been declared deceased. The man’s wife and daughter are being assisted by Police trauma counselors and the City of Cape Town tourism officials and the British Consulate are assisting the family. They are on holiday from the United Kingdom and he had been scuba diving with his daughter. Condolences are conveyed to the family. At 13h35, Saturday, 16th March, NSRI Bakoven duty crew were alerted following eye-witness reports of a whale appearing to be washed ashore in among rocks between Clifton and Glen beach. On arrival on the scene it was confirmed to be a juvenile Southern Right whale carcass, approximately 6 to 7 meters. The City of Cape Town (CoCT) Marine Animal Stranding Network and the Department of Environmental Affairs – Oceans and Coasts were informed. 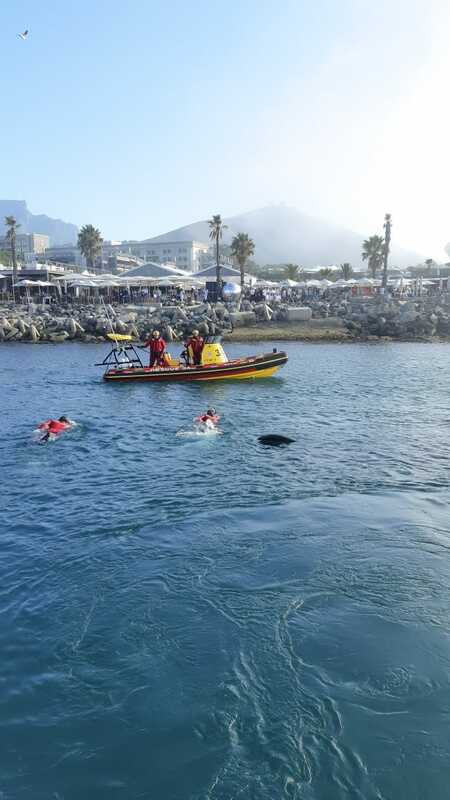 CoCT Law Enforcement officers and CoCT Marine Animal Stranding members were dispatched to the scene and a request was made to NSRI to tow the carcass to the OPBC (Oceana Power Boat Club). 2 NSRI Table Bay sea rescue craft, Spirit of Vodacom and Spirit of Day were launched. Arriving on the scene, rescue swimmers were deployed into the surf and a towline was rigged. The whale carcass has been towed to OPBC where CoCT Law Enforcement and the CoCT Solid Waste Management are arranging the removal of the carcass. Samples for research will be taken by the Department of Environmental Affairs – Oceans and Coasts and Gregg Oelofse of the CoCT Marine Animal Stranding Network confirmed that it is suspected that the whale died from injuries sustained from a ship strike. On the afternoon of Friday, 15th March, at 12h39, NSRI Port Nolloth duty crew were activated following eye-witness reports suspecting a vessel to have run aground in a small bay at Port Nolloth. NSRI Port Nolloth responded to the scene to find a diamond mining boat close in-shore but at anchor and in no danger. No further assistance was required and confirmed to be a false alarm with good intentions.